That younger audiences are more likely to watch highlights on Snapchat than they are full match on Sky Sports is a moot point for the broadcaster, one it believes is less of a factor in its much-publicised drop in viewers. Rather the headline stat – a 19% drop in viewers last year – doesn’t tell the full story. Yes, younger audiences are less likely to engage and consequently view fewer full matches but they have never been the broadcaster’s predominant subscribers. So, while millennials may be a factor in a dip that has caused some observers to decry the value of the pay-TV model, they can’t be the only one. From the Olympic games to the number of televised matches of teams with smaller fanbases like Leicester City, the alarming stats cloud a complicated picture, one that reveals seasonal one offs and a 2015/16 season devoid of the tentpole clashes that have made it appointment to view TV in bygone years. Look no further than the BBC as proof that televised sport continues to hold its own amidst a splintering media landscape; the success of the broadcaster’s FA Cup matches attracting similar audiences to international games. It’s a view that goes some way to explaining Sky Sports unwavering faith that live sport will “always” remain premium. Faith that naysayers argue is misplaced given the average viewing figures for the Premier League (as of last November) was 1.03 million in comparison to the one million who currently watch Snapchat Discover channels daily in the UK. Since Rupert Murdoch bet big on the Premier League in 1991 to rescue its faltering satellite business, the past 26 years have seen it push the primacy of its live crown jewels. Now it can no longer ignore social media, Sky Sports’ objective is more about positive brand association. For the big broadcasters it’s not just about having the content to sell to subscribers, it’s also about making sure they are the brand associated with the best sport. Just look at the amount of marketing it ploughs into its content – that’s not just to promote programming, it’s to say ‘we are big powerful presenters of sport’. How social fits into this is still a work in progress, though what’s already clear is an attempt to show a lightness of touch. Highlights aside, more entertainment-led content litters its feeds now, ranging from the Carling ‘In off the bar’ challenge on YouTube and Facebook to a snap of pundit Paul Merson humorously failing to pronounce the names of certain players. But “we don’t rely on them [social networks] for traffic,” assured Gibbs, who points to its own platforms – the site and the app – that are “growing year-on-year” and consequently is why he isn’t worried about whether those same businesses become rights owners. The key question is how media rights holders like Sky Sports co-exist with the likes of Snapchat and Facebook, and how they benefit from these digital channels while retaining the value of long-form content via paid-for models and advertising. Whereas rights were previously packaged to ensure maximum protection to the live content and the main licensee, now those same rights holders have come round to allowing some of their content on social media where the audiences are now. Having gained digital rights to the Premier League at the start of the season, Sky has spent the past six months packaging the same content in different ways on Snapchat, Facebook, Twitter, Instagram and YouTube. While there’s still much to learn about all five, there’s a sense that Snapchat is the one to intrigue its producers the most to date. A closer look at its Discover channel explains why: Posting between nine and 12 times per edition has seen the edition double its viewers over the last six months, with seven in ten of those aged between 13 to 25-years-old. Most of these posts are highlights, pulled from the longer widescreen video highlights of matches, which earlier this month would have included goals from Sunday’s Manchester United versus Liverpool match repurposed for the vertical video format with added graphics. For matches like this, the clips won’t be made until after midnight. Not bad for a Snapchat team of four, each member publishing each daily edition at 5pm. Deadline aside they are not averse to publishing content as things happen as well as hitting the post-school rush given its younger audience. These viewers aren’t necessarily “great readers”, admitted Mark Alford, head of digital publishing at the sports broadcaster. Instead of giving people information and facts in a traditional third-person way (as if they were watching TV), Sky tries to pull people into a news event first-person. Inevitably, the Snapchat team’s experimentation with this tact hasn’t always paid off like when it tried to tell the Champions League story without any media rights in a Bleecher Report-style video interspersed with stills only to realise it shouldn’t be looking to mimic those rights given its impressive cache. Discover is just one half of the Snapchat puzzle, the remainder of which it hopes to tackle in Stories, a collection of Snaps (photos and videos) that a brand and its followers would publish over the course of a 24-hour period. “That’s one of the things we want to crack in 2017,” said Alford. 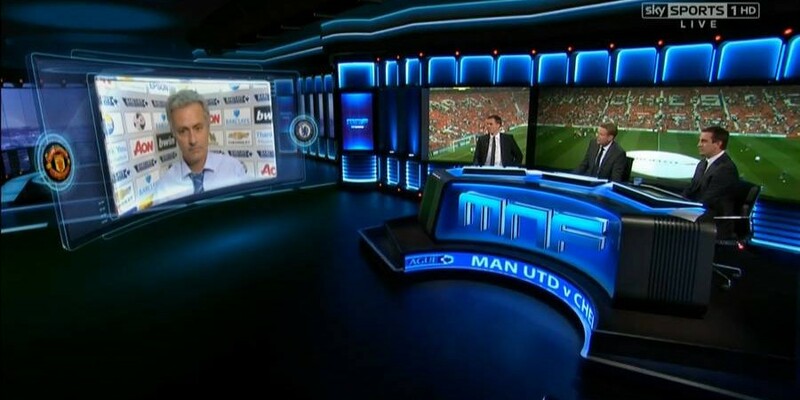 Whether its highlights on Snapchat or a chatbot version of its presenter Jeff Stelling on Facebook Messenger, Sky knows it must adapt to a more pervasive way of watching sport. And while it might not be ready to hit the panic button just yet, the already multi-million pound stakes have been raised by a decline that is yet to reveal itself as either blip or trend. However, there are some media observers who have already decided that Sky’s slip in viewers last year further proves that TV subscriptions could soon be a thing of the past. “Even something like the English Premier League football, which seemed like the most reliable stream of revenue for broadcasters, is no longer immune from this shift in consumption,” said co-founder and chief executive of Wochit Dror Ginzberg. While BT and Sky Sports have spent billions of pounds to secure exclusive rights for this live content, ratings have been declining, with early ratings this season down by a fifth. Meanwhile, BT, who trumped Sky Sports to both Champions League and Europa League rights, showed the finals of both competitions on YouTube in order to boost surprisingly low audiences. When asked about the prospect of launching a new kind of subscription model in response to the shift, Sky’s Gibbs said he “did not know” before citing the Now TV service, which launched four years ago and allows people to watch sport on a daily, weekly and monthly basis for a fee, as an example of how it’s trying to “talk to new audiences”. “Maybe pay subscriptions are beginning to look a little ‘analogue’ in the social media age,” said Kelly Williams, managing director of Sports Revolution.